FMIC, Abuja: The partnership between the Federal Ministry of Information and Culture and the Tony Elumelu Foundation will help to re-position the Creative Industries in Nigeria, the Minister of Information and Culture, Alhaji Lai Mohammed, has said. Speaking at a ceremony for the signing of the Memorandum of Understanding (MoU) between the Ministry and the Foundation in Lagos on Tuesday, the Minister expressed the strong belief that the collaboration will be the much-needed catalyst to transform the country’s Creative Industries to a Creative Economy. ”The MoU contained details of how we will work together to execute our partnership. More specifically, the areas of collaboration will include the creation of an enabling business environment for the creative industries with such incentives as easy access to finance; the structuring of the Creative Industries to enable it generate independent revenues locally and also boost exports to increase Nigeria’s foreign exchange earnings; and comprehensive statistics about the Creative Industries, including its size and projections, to guide potential local and foreign investors,” he said. He explained that the agreement was part of efforts by the Federal Government to ensure that the Creative Industries become a major factor in the ongoing diversification of the country’s economy. ”To reap the full potentials of the Creative Industries, we realized early on that we will need to reach out to organizations that have the capacity and the drive to assist us in achieving our goals, organizations that can utilize their business knowledge, network and technical expertise to assist the Ministry in the development of Nigeria’s Creative Industries. ”This explains why we entered into discussions with the Tony Elumelum Foundation and the British Council. The discussions have now yielded fruits. On Aug. 24th 2016 in Edinburgh, Scotland, we signed an MoU with the British Council. 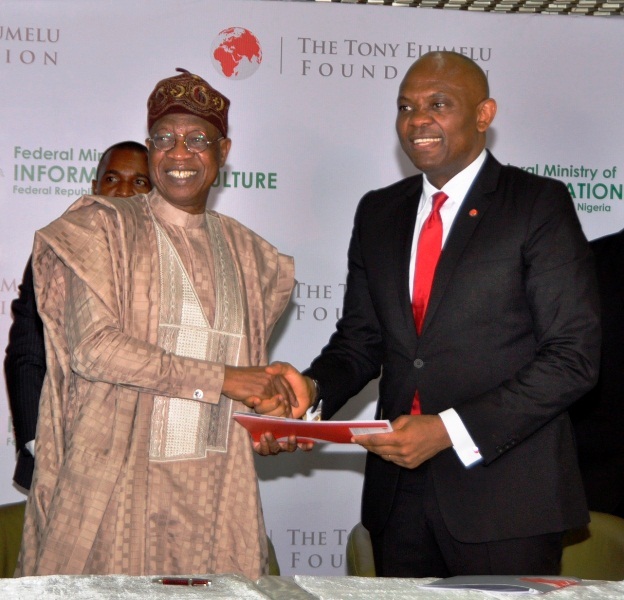 And today, we are signing another MoU with the Tony Elumelu Foundation. Together, we will work to re-position the Creative Industries in Nigeria,” the Minister said. He said provision must be made for concrete benchmarks ”to measure our progress in the implementation of this MoU” to ensure that ”by the time we conclude the initial two-year period of this historic collaboration, no one will need to strain his eyes to see the achievements”. publishing to Radio and Television. For his part, Mr. Elumelu hailed the Minister for the partnership initiative, and assured that even more of his colleagues in the private sector would support the Creative Industries once they are properly structured. The ceremony for the signing of the MoU by the Minister and Mr. Elumelu, which was held at the National Theatre, was attended by major industry players, including Nollywood and music stars and Comedians, as well as beneficiaries of the Tony Elumelu Entrepreneurship Programme, which aims to identify, over 10 years, a total of 10,000 African start-ups and entrepreneurs with ideas that can generate at least 1,000,000 new jobs and contribute at least 10 billion dollars in new annual revenues across Africa.